John Corbett is one of my favourite music writers. 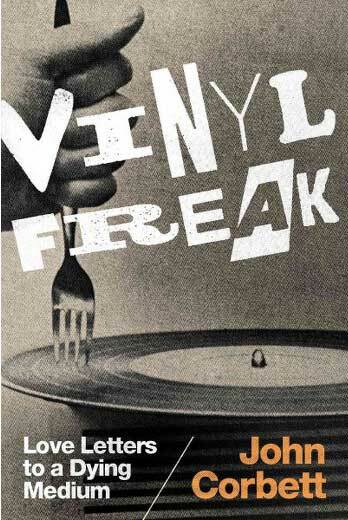 This book gathers up his elegaic and highly informative columns for Vinyl Freak magazine along with a series of mediations or essays on his love of music, an engaging mix of autobiography, reflection and storytelling. There are lots of colour pictures of record sleeves too. Corbett is at his best here when considering the ‘objectness’ of records, in contrast to MP3s or CDs (which he suggests is now a dying medium, as records see a resurgence of interest and production), when he tries to distinguish between collecting and hoarding, and when he enthuses about how it used to be, hunting for rare vinyl in fleemarkets and junk shops, rifling through boxes of used records hidden away in back rooms of record stores. here’s also a fantastic closing chapter about the (literal) excavation of the Sun Ra Arkestra’s archive from a condemned house, and how Corbett devotes space and time to ordering and cataloguing said archive, as well as finding a home for much of it at various institutions, and how it also brings him to his senses and allows him to rationalise and be more sensible about his enthusiasm for unavailable music. He’s no fool, he knows most music can now be downloaded for free online, and that sometimes we just want to hear it; but he also knows the allure of owning one of, say, 50 or 5 copies, sometimes the only copy, of something only ever released once, back in the day. He knows MP3s, flac files, CDs, 8-tracks, cassette tapes, even at one time DAT, have their uses and enable us to listen so; but he also knows how great LPs are, with their gentle patina of sound & time, their art work and lyrics sheets to read, their 20 minutes per side allowing for tea, toilet and attention breaks. So, all well and good. Corbett is good at confessing what he once bought, listened to, enthused over, found and swopped. But I confess the columns themselves are a little bit uninteresting. The concept is that he would write about records that have never been reissued since their initial release (although some of course has been put out again in the last decade), be they arty small runs or ignored or forgotten items by major artists. Now, I like jazz, I like improvised music, I sometimes like sound poetry and musique concrete, but few of the reviews or mini-essays here made me want to track down or listen to these records. Maybe that’s because a lot of them felt like mainstream jazz, which I’m not that into? Maybe it’s because I know the music of some of the musicians discussed and don’t want to hear any more? I also felt , especially in the final set of reviews, which is presented as a list of brief summaries, that this stuff is still available – albums by the Recedents, Lol Coxhill, James Blood Ulmer and others mentioned aren’t hard to find. Maybe it’s a UK/USA thing, or maybe I’m just a better hunter for rare vinyl? Maybe I just got lucky. Anyway, I’d have liked more of Corbett’s writing about collecting and music, less of the reviews of and opinions about specific albums, certainly lots more about the Sun Ra material, which underpins his final chapter and is presumably what allows the first run of this book to be accompanied by a flexidisc (yes, a flexidisc! – my 18 year old daughter didn’t have a clue what that was…) of a Sun Ra track. I haven’t dared to tear it our and play it, much as I want to. It’s almost like I don’t need to: I own it now and as the song title says. ‘It’s a good day’. This entry was posted on 27 June, 2017 in homepage and tagged John Corbett, Rupert Loydell. Bookmark the permalink.